Be brave. Know your own value. And negotiate the hell out of your return. Kristin Holter, Global Human Resources | Transformation & Change | Talent Management | Delivers an Organisation’s HR and Business Goals. Thousands of people face the challenge of reigniting their careers after a period away from work. 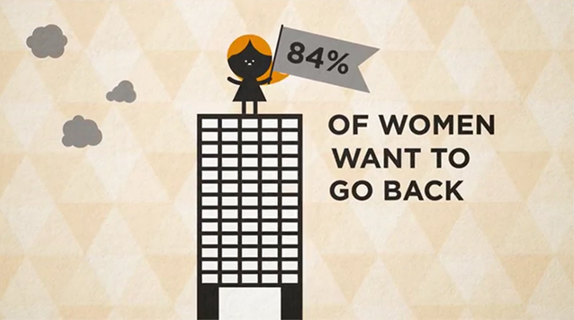 According to the recently published book “She’s Back: Your guide to returning to work,” 84% of women who took a break from a professional career want to return at some point. She’s Back takes a data and evidence-based approach to unpacking what is happening today in our workplaces and our recruitment functions that is making it difficult for women to have both a career and a family. Their research shows that 75% of people who want to return believe that work is not flexible enough, with many workplaces stuck in a culture of presenteeism. Your experience during your career break makes you stronger on your return. Challenge your own self-limiting beliefs, because what’s going on in your head is the biggest thing holding you back. Get your story straight and get ready to recite it in a way that impresses others. Adopt a #karmanotkickbacks mindset on networking (She’s Back research found that you are 4 times more likely to find a job through your network than through a recruitment agency). Modernize your tools of the trade, including your CV, LinkedIn profile and interview approach. Women are an extraordinary talent pool whose life demands sometimes don’t fit a traditional working model. This really matters, not just for individuals but for employers. According to She’s Back, the cost of losing these women runs to the millions. At least £2 million per year for an organisation employing more than 1,000 people. It’s not just for women. A growing number of fathers want the possibility to be involved in parenting their children without sacrificing their career. It’s about attracting a new generation that is not looking for jobs-for-life and certainly won’t sign up to 80-hour work weeks. We are all living longer and the concept of a career ladder is obsolete. Organizations need diversity if they are to succeed in a world that is demanding more creativity and innovation. Organizations are held to account by increased social media transparency, and a lack of diversity is not an attractive employer brand. Disruption in the world of work means that jobs, working patterns and practices will not look the same in a few years’ time. As an employer, you play a role in shaping what they will eventually look like. She’s Back offers valuable insights for organizations, delivered in a straightforward and no-nonsense way. At its core, She’s Back is a clear and compelling guide to help people build meaningful and sustainable careers throughout their working lives. It will excite, inspire and inform you about how to find work that will work for you. As an HR leader, I am a work-in-progress and so far I'm good at solving problems, building great teams, creating engagement, partnering with peers, project management, change management, and above all working together to deliver results. I strive to learn, and I am currently interested in digital and the future of work. I have always been a passionate student of inclusion and diversity.